A new LFM-signal detector formulated by the integration of the 4th-power modulus of the fractional Fourier transform is proposed. It has similar performance to the modulus square detector of Radon-ambiguity transform because of the equivalence relationship between them. But the new detector has much lower computational complexity in the case that the number of the searching angles is far less than the length of the signal. Moreover, it is proved that the new detector can be generalized to the integration of the n th-power ( ) modulus of the fractional Fourier transform via mathematical derivation. Computer simulation results have confirmed the effectiveness of the proposed detector in LFM-signal detection. The detection of the Linear Frequency Modulation (LFM) signal is very important in many information systems, such as communications, radar, and sonar, for its wide use in these systems. In recent years, several time-frequency-based methods for LFM-signal detection have been proposed. Several intelligible detection algorithms using the short-time Fourier transform (STFT) or wavelet transform are mentioned in [1, 2]. However, the poor resolution according to the narrow or time-variant window used in the analysis limits their applications in practice. The discrete chirp-Fourier transform is employed in  to estimate the chirp rate of LFM-signal. But its rigorous constraint, that signal length must be prime number and the chirp rate must be integer, limits its application. Since the LFM-signal distributes as a straight line in the Wigner-Ville distribution (WVD) plane, the Radon-Wigner transform (RWT) algorithm computes integrals along the lines with different angles and positional offsets in the time-frequency plane to detect the LFM-signal [4, 5], and a two-dimensional search is necessary to track the straight lines in the time-frequency plane. The lines, whose integral values exceed a certain threshold, correspond to the LFM-signal. Similar to WVD, the ambiguity function (AF) of the LFM-signal distributes as a straight line passing through the origin in the AF plane. Therefore, Radon-ambiguity transform is also used to detect the LFM-signal, especially in the case that the chirp rate is the only parameter of interest, and two kinds of detectors (the envelope detector and the modulus square detector) have been studied in . For Radon-Wigner transform or Radon-ambiguity transform, both the calculation of the full time-frequency plane (or AF plane) and the transformation from the Cartesian coordinate to the polar coordinate are indispensable, whose high computational complexity severely hinders the usefulness of the two methods in the LFM-signal detection, especially in the case of long signal detection. Recently, as a new time-frequency analysis tool, the fractional Fourier transform (FRFT) attracts more and more attention in signal processing field [7, 8]. Several methods based on FRFT have been proposed to detect LFM-signal and estimate its parameters [9–12]. An effective method for parameter estimation and recovery of time-varying signals including LFM-signal by using FRFT is proposed in . According to the equivalence relationship between RWT and the fractional power spectrum [13, 14], a LFM-signal detection and parameters estimation method based on FRFT has been presented [10, 11], which achieves a near-RWT performance at much lower computational complexity. Similar to WVD, ambiguity function also has a close relation to FRFT [12, 15, 16]. Then an LFM-signal detector using fractional autocorrelation, which corresponds to the envelope detector of Radon-ambiguity transform, is proposed . In this paper, we propose a new LFM-signal detector formulated by the integration of the 4th-power modulus of the fractional Fourier transform. The new detector is equivalent to the modulus square detector of Radon-ambiguity transform and performs similarly as well in LFM-signal detection. But the new detector has much lower computational complexity in the case of long signal detection, or in the case that the possible distribution area of the signal in the ambiguity plane is limited to a small-angle sector. Mathematical derivation proves that the new detector can be generalized to the integration of the n th-power ( ) modulus of the fractional Fourier transform. The structure of this paper is as follows. In Section 2, a simple review of the definition of FRFT and its relation to AF are given. The modulus square detector of Radon-ambiguity transform is briefly introduced in Section 3. The new detector based on FRFT is proposed and its computational complexity compared with Radon-ambiguity transform is discussed in Section 4. Section 5 gives the mathematical derivation of the generalization of the new detector. Computer simulations are given in Section 6 to show the effectiveness of the proposed detector. Finally, conclusions are made in Section 7. The standard Fourier transform is an operator that transforms a time domain signal into a frequency domain representation. In time-frequency plane, Fourier transform can be interpreted as a counterclockwise rotation operator from the time axis to the frequency axis. FRFT, as the generalization of the standard Fourier transform, can be considered as a counterclockwise rotation of the signal coordinate around the origin on the u axis with an arbitrary angle , and transforms a signal to an intermediate domain between time and frequency. Therefore, FRFT can be classified into the time-frequency analysis tools, and it is strongly related to other important time-frequency transforms, such as WVD and AF. By combing AF and Radon transform, a new LFM-signal detection method called Radon-ambiguity transform has been established . It is more efficient than RWT in the case that the chirp rate is the only parameter of interest. Similar to WVD, AF also has simple but important relation to FRFT, and the transformation between them is easily expressed by a simple formula [15, 16]. Equation (6) reveals the relationship between AF and FRFT as follows: the slice of AF at angle in the ambiguity plane is the Fourier transform of the fractional power spectrum of angle . Based on this relationship, an LFM-signal detection and chirp rate estimation method using FRFT, which has similar performance but lower computational complexity compared with Radon-ambiguity transform, is proposed in this paper. The detector's good performance is discussed in detail and its usefulness in LFM-signal detection has been well demonstrated by some numerical examples in . The equivalence between the new detector and the modulus square detector of Radon-ambiguity transform can be easily demonstrated from the derivation process. For LFM-signal, the new detector will reach its maximum when the angle is equal to –arc cot(K), where K is the chirp rate of the LFM-signal. According to the equivalence relationship between the new detector and the modulus square detector of Radon-ambiguity transform, they have the nearly same performance except the computational complexity in theory. We assume that the signal length is N and the number of the angles to search is M. The computation of Radon-ambiguity transform consists of the calculation of AF, the transformation from the Cartesian coordinate to the polar coordinate, and the Radon transformation . The calculation of AF in the full of the ambiguity plane consists of N-multiple fast Fourier transform, and has a computational complexity of . The computational complexity of the coordinate transformation depends on the details of implementation. The computational complexity of the Radon transformation is O(MN). Thus the total computational complexity of Radon-ambiguity transform is more than . The computation of the new method proposed in this paper consists of M-multiple fractional Fourier transform and the integration operation. Recently, several algorithms for the calculation of FRFT with different accuracies and computational complexities have been proposed [17–19]. In this paper, we adopt the decomposition algorithm proposed in , which can be implemented by FFT and has a computational complexity of . Taking the computational complexity of the integration operation into consideration, the total computational complexity of the new method is just only . It can be seen that the computational complexity of the new method is much lower than that of Radon-ambiguity transform when the number of the searching angles M is far less than the length of the signal ), which is most likely to occur in the case of long signal detection, or in the case that the distribution area of the signal in the ambiguity plane is limited to a small-angle sector, or in the case that the possible chirp rate of the signal is limited to a certain range. Figure 1 shows the comparison of the variation of computational complexity for the two methods with the increase of signal length N and number of searching anglesM. Obviously, as N and M ( ) increases, the computational advantage of the new method becomes more and more significant. The computational complexity of the two methods. Dashed line: the modulus square detector. Solid line: the new detector. An interesting phenomena, that the effective detector is not only limited to the integration of the 4th-power modulus of the fractional Fourier transform, but can also be generalized to n th-power modulus for , is found in our simulation. In this section, the mathematical derivation is implemented to prove it. 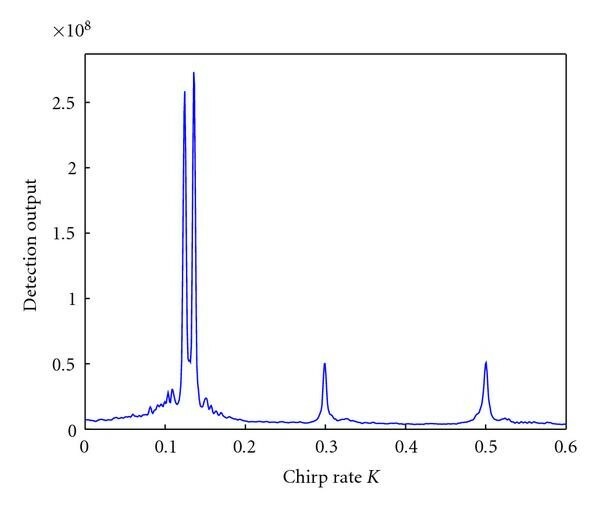 where K is the chirp rate of the LFM-signal. Substituting (29) into (15), an ordinary differential equation of the detector function can be obtained. The solution of the ordinary differential equation is obtained. It can be seen that, for LFM-signal, the generalized detector will reach its maximum corresponding to the chirp rate. Therefore, the generalized detector can be regarded as an effective detector for LFM-signal. However, the 4th-power modulus form detector is most frequently used in practice for its lower computational complexity compared with other generalized forms. Here the chirp rate is . is a complex additive noise, generated via two independent, zero-mean, Gaussian random processes of equal variance. 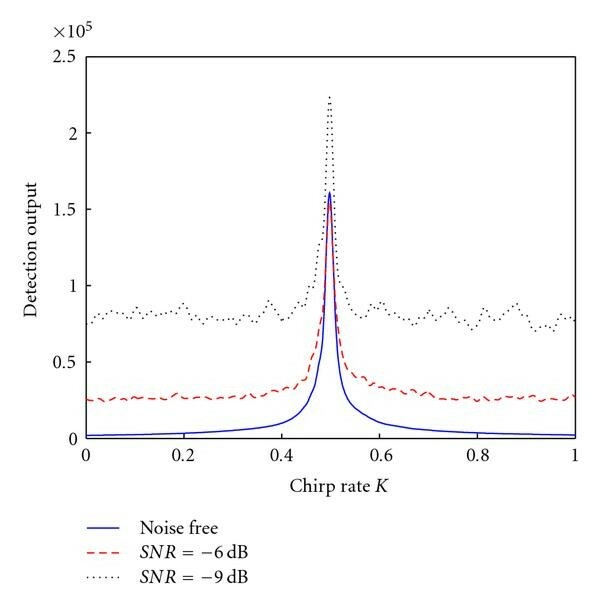 Figure 2 shows the outputs of the detector calculated via (12) with signal-to-noise ratio (SNR) equaling to , −6 dB, −9 dB, respectively, for different chirp rate values . The detection output of single-component LFM-signal using 4th-power modulus form. Solid line: SNR = . Dashed line: SNR = −6 dB. Dotted line: SNR = −9 dB. The initial frequency and chirp rate parameter values are as follows: , , , , , , , . 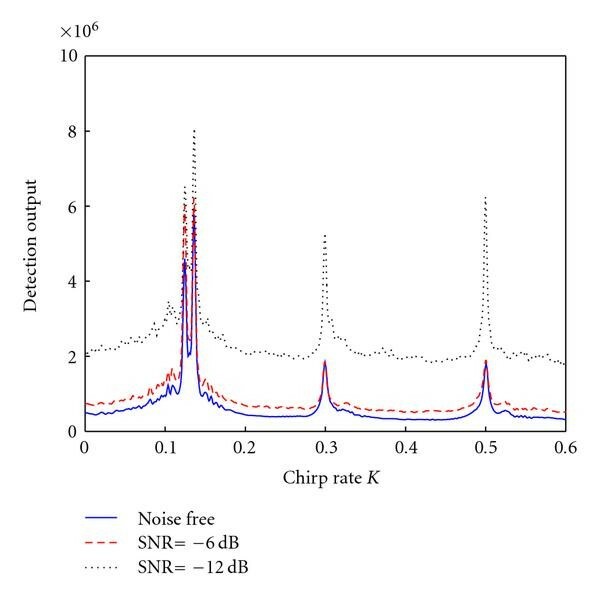 Figure 3 displays the detection output calculated via (12) with SNR equaling to , −6 dB, −12 dB, respectively, for different chirp rate values , . It can be seen from Figures 2 and 3 that the results agree with those in . 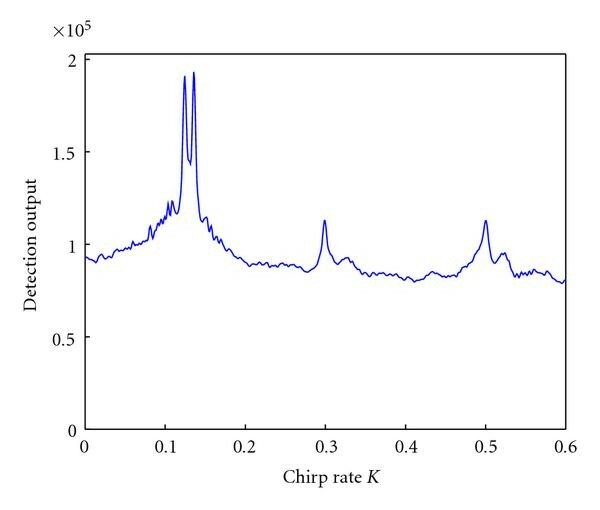 The peaks of the detection output occur at the chirp rate K corresponding to the LFM components, and there is an explicit one-to-one correspondence between the peaks and the chirp rates. All of the LFM components with correct chirp rate are accurately detected, and the two closely spaced chirp rates at and are also well resolved. The two simulations above have verified the effectiveness of the proposed detector formulated by the integration of the 4th-power modulus of the fractional Fourier transform. The detection output of multicomponent LFM-signal using 4th-power modulus form. Solid line: . Dashed line: SNR = −6 dB. Dotted line: SNR = −12 dB. Figures 4 and 5 show the detection outputs of the 3rd and 5th-power modulus detectors with SNR equaling to −6 dB, respectively. It is obvious that the peak value over noise floor in Figure 5 is higher than that in Figure 4. Then the conclusion can be drawn that the peaks are easier to pick in the noise floor as the order number of power modulus increases. However, the higher order power modulus also inhibits the smaller signals when the detected signal consists of multicomponent LFM-signal with different amplitudes. It means that we should carefully choose the form of generalized detectors according to specific conditions in the practical applications of the new method. The detection output of multicomponent LFM-signal with SNR = −6 dB using the 3rd-power modulus form. The detection output of multicomponent LFM-signal with SNR = −6 dB using the 5th-power modulus form. This paper presents a new detector of LFM-signal, which is the integration of the 4th-power modulus of its fractional Fourier transform. The new detector has equivalence relation to the modulus square detector of Radon-ambiguity transform, and performs similarly to Radon-ambiguity transform in LFM-signal detection under much lower computational complexity. Moreover, it has been proved mathematically that the new detector can be generalized to the integration of the n th-power modulus of the fractional Fourier transform for . Computer simulations have verified the effectiveness of the new detectors. This work is supported by the China Postdoctoral Science Foundation under Grant 20090460726. The authors would like to thank the anonymous reviewers who give some valuable comments for improving the quality of this paper.